Wendell Potter is the insurance industry's worst nightmare. 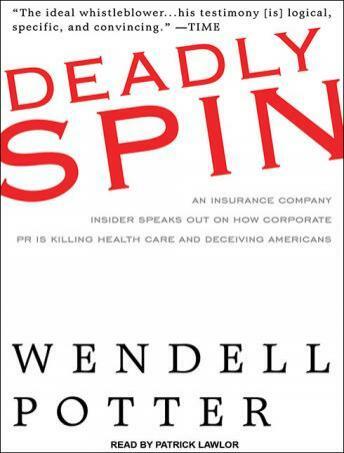 In June 2009, Wendell Potter made national headlines with his scorching testimony before the Senate panel on health care reform. This former senior vice president of CIGNA explained how health insurers make promises they have no intention of keeping, how they flout regulations designed to protect consumers, and how they skew political debate with multibillion-dollar public relations campaigns designed to spread disinformation. Potter had walked away from a six-figure salary and two decades as an insurance executive because he could no longer abide the routine practices of an industry where the needs of sick and suffering Americans take a backseat to the bottom line. The last straw: when he visited a rural health clinic and saw hundreds of people standing in line in the rain to receive treatment in stalls built for livestock. In Deadly Spin, Potter takes listeners behind the scenes to show how a huge chunk of our absurd health care spending actually bankrolls a propaganda campaign and lobbying effort focused on protecting one thing: profits. Whatever the fate of the current health care legislation, it makes no attempt to change that fundamental problem. Potter shows how relentless PR assaults play an insidious role in our political process anywhere that corporate profits are at stake-from climate change to defense policy. Deadly Spin tells us why-and how-we must fight back.